SPS Hot Tubs are official dealers of Beachcomber hot tubs. Beachcomber Hot Tubs have been producing quality hot tubs in Canada for forty years by the same family-run company lead by Keith and Judy Scott. 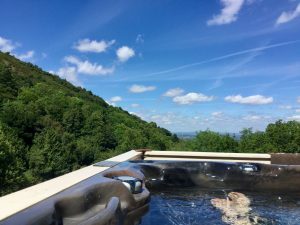 They are rightly proud of the product they produce and we believe they are one of the very best Hot Tubs on the market. Each Hot Tub is hand made to order Beachcomber offer the following qualities across the complete range. You can read more about the Beachcomber brand in ‘A Proud History’. They are deep enough to ensure that you can sit comfortably right down within the tub, with gently rounded contours on the seat and a generous foot well. Continual design attention to detail ensures a supremely comfortable hot tub. The shell is beautifully contoured so you don’t need cushioned headrests – which are ugly and can harbour germs and bacterial and be very expensive to replace. Beachcomber hot tubs are renowned for the quality of their water massage, are supplied with a 2 speed pump to allow users to alter the intensity of their massage and most models have the option of a separate foot massage. Beachcomber hot tubs are the most energy efficient hot tubs on the market according to independent testing. The State of California has recently introduced standards that has meant that hot tubs have to be tested to ensure that the meet a high standard of energy efficiency. And when tested, Beachcomber Hot Tubs not only came out on top, they were up to 57% more efficient than some other tubs that were tested! Beachcomber hot tubs are built in Vancouver to resist the extremes of the Canadian winter and so they are superbly well insulated, strongly built and cheap to run. Beachcomber is a leader in Energy Efficiency with features specifically designed to save your energy like: The Heatshield Cover is arguably The Best hot tub cover on the market. The 100% (Hybrid models) foam filled cavity insulates against heat loss. The Enviro-skirt Cabinet and Perma-Seal Base protects your hot tub from water penetration and environmental elements. A 2 year all-inclusive guarantee, 5 years shell/cabinet guarantee and a 30 year structural guarantee. Fourteen different models, each of which is available with a range of options and in 8 different acrylics and 5 skirt colours ensures that customers are spoilt for choice. Contact us now or pop into our showroom today. Imagine, you could be relaxing with your loved ones in the peace and tranquillity of your very own Beachcomber.